Kravica waterfall, often erroneously called Kravice, is a large tufa cascade on the Trebižat River, in the karstic heartland of Herzegovina in Bosnia and Herzegovina. 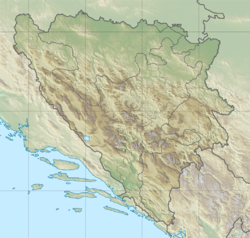 It is 10 kilometres (6 mi) south of Ljubuški and 40 kilometres (25 mi) south of Mostar. Its height is about 25 metres (80 ft) and the radius of the lake in the base of the waterfall is 120 metres (390 ft). Kravica is a popular swimming and picnic area and, during the summer, it is frequently visited by tourists from Mostar, Medjugorje and Dubrovnik. The Kravica Falls area also has a little cafe, a rope swing, a picnic area, and a place to camp. The best time of year for visiting is during the springtime when the fall is at its fullest and the arid landscape turns a bright green. During the high season, various restaurants in the vicinity of the waterfalls mostly offer grilled dishes and fish specialties. Near the Kravica Falls is also a small grotto with stalactites made of calcium carbonate, an old mill and a sailing ship. The owner of the waterfall was a famous municipal councilor, landowner, benefactor and philanthropist from Ljubuški, Zaim-beg Selimić. ^ "ZAIM BEG SELIMIC". ljubusaci.com. 28 January 2009. Retrieved 20 September 2017. Wikimedia Commons has media related to Kravica. This page was last edited on 9 March 2019, at 23:41 (UTC).